No one has added a helpful site for this 2010 F-150 problem yet. Be the first! I was driving down the highway with my family when we heard a loud popping noise inside of the cab. 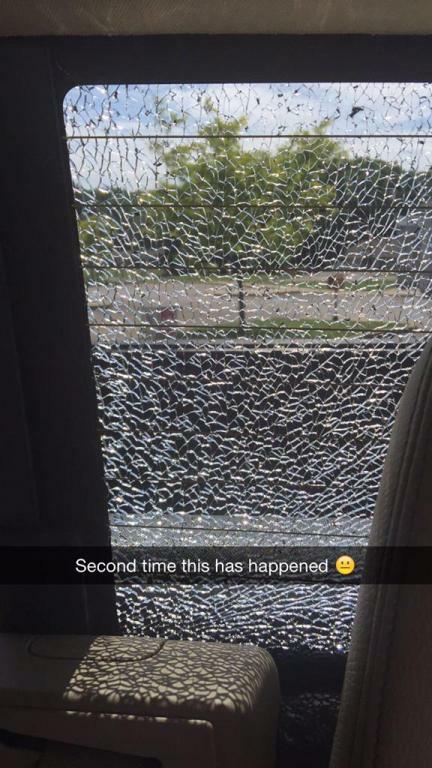 The rear window had spontaneously shattered above my 13 month old daughter in her car seat. I called Ford's Corporate Office in Dearborn, MI and I explained the situation that this is the second time this has happened to the rear window. The Corporate Ford Rep called a supervisor and ultimately they said it wasn't their problem, because it's no longer under warranty. This should be a class action lawsuit or Ford needs to officially recall this manufacture defect. I was on the highway and out of nowhere I heard a loud popping noise and noticed my rear window had mysteriously shattered. I thought it had been shot out, but there was no evidence of that. The entire window just spider webbed. Well, just this morning no more than a few blocks from my house as I was driving to work, I hear a very loud bang almost like something very heavy crashed into the vehicle. I was only driving about 20 mph through my neighborhood so I pulled over and realized that the passenger rear window was shattered. It was only about 35 degrees F this morning but everything was fogged up so I turned on the rear defroster. I Googled this issue and sure enough this is a widespread issue with hundreds of F-150 owners experiencing the exact same problem.This is definitely a manufacturer defect but Ford will not cover it. I am scared to use the rear defroster now. With this along with the major run problems in the rocker panels on these trucks, I am done with Ford! Terrible craftsmanship and they don't stand behind their products. Turned on my rear defroster and smoke in the cabin and rear passenger side shattered, but stayed in place. Then read about lots of the same problems on same year trucks. Ford would not cover it. Definitely a manufacturer defect. I am scared to use the rear defroster now. Was driving slowly when we heard a loud bang which sounded like something like a baseball or rock hitting the truck. Checked it out and saw no exterior damage whatsoever, then noticed one of the three panels on the rear window was completely shattered although still in place. Again no sign of impact of any kind on the glass, just cracked through and through. So my rear window blew out for now the second time in 47,000 miles. First time it happened with 17,000 miles and the dealer fixed it no questions asked. They even had another truck at the dealer being fixed for the same issue when I took mine in. Now 2 weeks ago it happened again at 47,000 miles. Both times it was same thing using rear defrost and the passenger side section shattered. After Ford denied to fix it my dealer even argued saying this was a Ford problem and nothing I did but they still refused to go good for it. My dealer gave me a discount on window and said it would be $584.00 to fix it. I think I'm going to have a full one piece window installed since rear windows appear to be a wear item to Ford. I love my truck but if this is the customer service I get from Ford I'm done with them and will buy from Toyota or GM in the future. My family and I was just driving down the road going about 60 MPH and it sounded like a loud gun shot. We wasn't sure what it was. When we got to town we noticed the back passenger windshield was SHATTERED. We just bought the truck on March 7th and this happened on March 25th. The dealer wont cover it and neither will Ford so now I've got to claim a claim with my auto insurance. My monthly rate is probably going to go UP!!!! And it had NOTHING to do with anything that I have done. Ford needs to RECALL this problem. I see videos on YouTube and all over different websites where this has happened starting with the 2010 model F150s. This is A SHAME!!!!!! Like FORD don't have enough $$$$ in their pockets from all the vehicles the public has bought from them. SHAKE MY HEAD!!!!! Rear window spontaneously shattered on the way to work one cold January morning. Was told to not use the rear defroster when it's cold outside. Supposed to let the cab warm up first, then apply the rear defrost. When it's -30C, I guess that means warming up the truck for about an hour before I can use it. I looked at future years and it still seems to be a problem with them. Ford really needs to fix this. Ford F150's, most notably 2010's but more recent model years as well, have a known issue with the rear defrost that causes the unit to overheat and shatter the rear, back passenger side window. This happened to me in September of 2012 with less than 20,000 miles on the truck, now again on March 21, 2016 with 50,000 miles on the truck. Ford will not acknowledge this as a problem requiring a vehicle recall. Well, it's a problem - especially when you have children / pets sitting in the back seat and the unit causes smoke to emanate followed by a "pop" and shattered windshield. What the hell am I supposed to do when the windows fog up or are frozen solid from snow, ice and freezing rain?! Aside from using the rear defrost and having to replace the back windshield each and every time I use it, that is. I hadn't used it since the first instance for fear that this would happen again. Well, I made the mistake of giving it a try again and here I am complaining about my F-150's electrical issues once more. Anyone else also have recurring issues with the driver side speaker? That's been replace three times and it still cuts out at less than LOUD volume. Time to start looking at RAM Trucks. I'm so disappointing in Ford Motor Company as I've been a loyal customer (Explorer, Taurus, F150) but all that's gotten me is failed transmissions at 60,000 miles, horrible dealership experiences, horrible service experiences and headaches with an inevitable ulcer surely on its way. Why does the back glass explode like this? This is the second time this has happened in as many years. I have a rear slider. Nothing hit it. Both times it was between 40 -50 degrees dry and sunny. Driving to work in the early morning there was a light mist/ fog that had formed on the back window overnight. Turned on the rear defrost for less than 5 miles or about 5 minutes when I heard a loud pop. Didn't think much about it till I got to work. Upon stepping out of the truck I realize that the back passenger side window was completely shattered. Oh great. What a great way to start my day. Started doing some research on this to find out how much money I was going to be out. Low and behold I stumble upon this site. Go figure this is the most common complaint with this truck. Back window shatters when the rear defrost turns on. In order to have this problem fixed I had to replace the entire back glass including the slider at a cost of $564.00 for the window and labor. Ford has failed to acknowledge that this is a common occurrence with this truck. Do not plan on buying another Ford product. I went out to start the truck early that morning. It was very cold and frosty. I let the truck warm up for around 10 min. before we left. I buckled my 5 year old granddaughter in her booster in the back seat right under the far right window. Then I got in and turned on the rear defrost. We were headed to the hospital in Ronan about 3 min. away. Half way there we heard a very loud pop! It sounded like a gunshot! My granddaughter panicked and screamed. This is not the first this has happened to her. Her daddy, my son-in-law; who also drives the same type F150 had the exact same thing happen to him and all 3 of his children. He thought he had been shot at as well! Scared the kids to death. My granddaughter to this day won't ride in the back under that window. I took the truck right over to Don Addsen Ford in Ronan. They acted very disinterested in my complaint. I could only get one salesmen to even come out and look! I am a single woman who runs a daycare in my home. 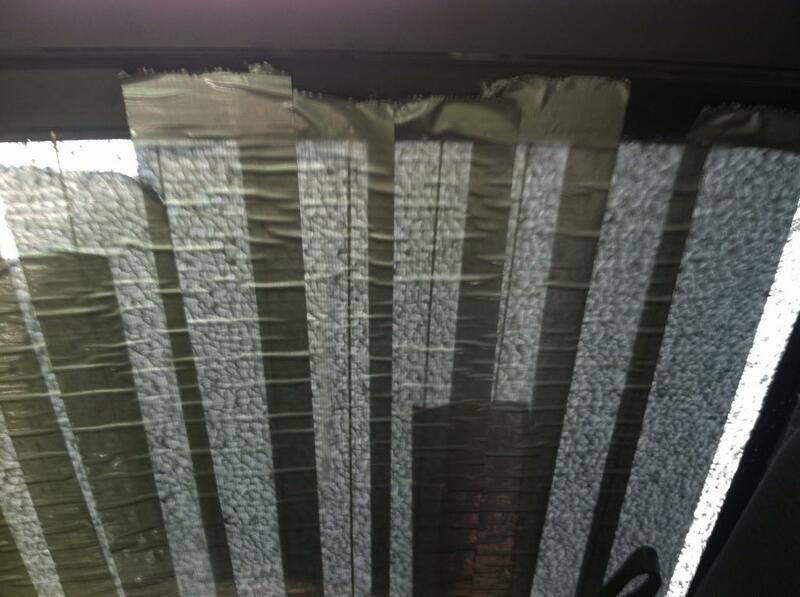 I can't afford to get this fixed so I'm driving around with cardboard and duct tape covering my view for backing up! I checked prices; $680.00 to replace it. Cash up front. Or a plane glass one for $288. COME ON FORD !!! GIVE ME A BREAK! I DON'T FEEL SAFE TRANSPORTING MY GRANDKIDS ANYMORE!!! Was headed out for a 1500 mile trip and heard a loud crack behind me and looked back and the rear passenger side window was shattered. Had to stop for some duck tape to keep it from all blowing out and headed on down the road. Didn't talk to my Ford dealer or anyone yet because nobody is open on New Years Day so we will see if Ford will do anything about this. Looks like I'm not the only one having this problem so Ford needs to recall these rear windows. On Moday, my husband was driving his F-150 to work with the rear defrost on, outsdie temp was approx in the 30/40s here in Michigan. As he was driving he heard a loud pop, similiar to a gun shot. He looked back and the rear window (driver side) was completely shattered, but still intact. I will post pics hopefully at a later date, having uploading issues. From the outside of the truck you can't tell that the window is shattered, but you can definetely tell from the inside. WHY why whyyyyyy hasn't FORD isssued a recall? Clearly this has happened to several people now and it's not fair that I have to come out of pocket 600$ just before Christmas to replace this POS defective garbage. I bought this truck used about a year ago. I love the truck and haven't had any issues with it until today. I turned on the rear defroster this morning and the very back window on the passenger side just shattered a few minutes after turning on the defroster. Nothing hit the window. The temperature outside was balmy in the high 50's. This window should not have shattered. I wasn't even moving when it happened. I have 4 vehicles, and I have a $0.00 deductible for comprehensive on all of them, or so I thought. Apparently I made a mistake when I insured my truck last year. I have a $500.00 deductible on it! Imagine my surprise there! Well, now I'm screwed on it this time. I called my insurance company and immediately had them change my deductible to $0 but that doesn't help me in this instance! I've read many complaints on these back windows of the F-150 just shattering for no apparent reason! I'm another casualty I guess. Ford definitely needs to re-look at this issue!!! Driving down the road when I heard a gunshot like noise. It was somewhere around 30 degrees outside and I had the rear window defroster on. Rear glass was shattered. Ford couldn't provide me any details about the issue and told me it would not be covered under standard warranty, aftermarket warranty or certified preowned warranty (I owned the truck for about a month at this point). Second time in 16 months I've replaced the back glass. Driving down the road, heard a gunshot and my rear window is broken again. Original glass company told me they won't cover it, Ford was no help and my insurance company was left to pay for it again. Love my truck, but this is really annoying. Am I going to have to replace the glass yearly? Come on Ford, fix this problem. Was driving to work, heard a loud pop and looked back to see the passenger side rear window had shattered. I don't recall turning on the rear defrost. Didn't need it in the middle of the summer. Called my Ford dealer I got the truck from and sure enough there are no recalls. Their price is $557. No gonna pay that!!! If you read my first rant... this is the second time the rear window has shattered!! Goggled the issue and found this web site. I will continue to find other wed sites to post my negative experience with Ford.